We’ve inherited a milk glut so I’m working my way through recipes that will deal with it. As it’s Sunday, we needed something to be the centrepiece of our evening meal. And this recipe made enough for leftovers tomorrow for a speedy working Monday dinner, win. 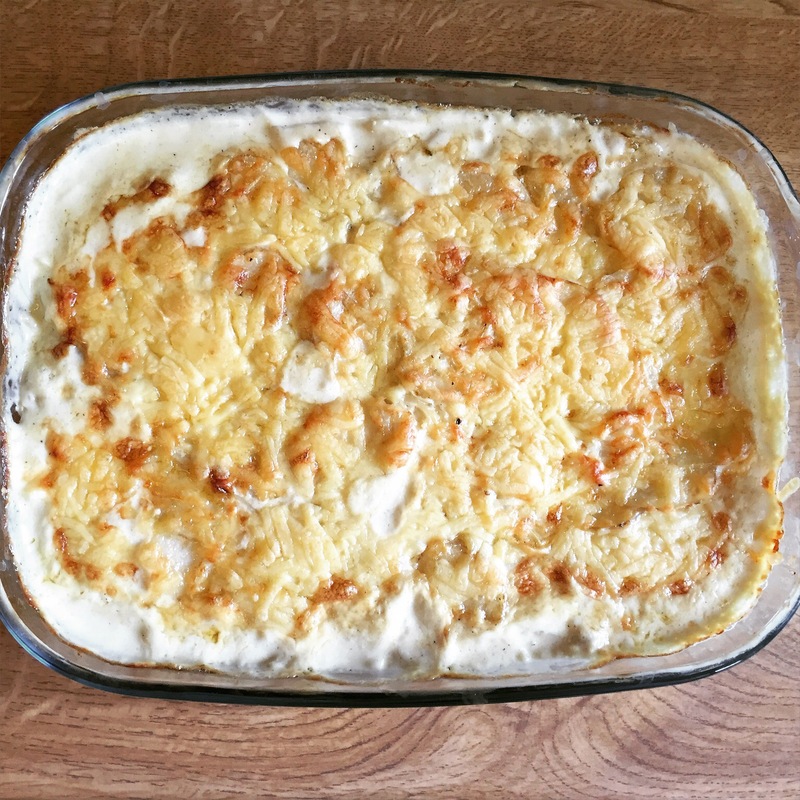 The secret to making a good gratin, that doesn’t need weeks in the oven, isn’t in danger of burning and always ensures fully cooked potatoes is: par boil the potato slices in the milk/cream mixture. I couldn’t believe it when I stumbled across this piece of advice. For years I’d been struggling with gratins either taking f-o-r-e-v-e-r to cook or having to deal with undercooked veg. Not a nice thing in a potato. Slice the potatoes and onions (extremely carefully!) with a mandolin to ensure even wafer thin slices. Place the potatoes and onions into a pan containing everything else apart from the cheddar. Cover and bring to a boil. Reduce the heat and simmer for ten minutes. Once par cooked, tip into a baking dish, cover with cheese and bake at 160 for 30-40 mins. Serve as you wish. We had carrots, cauliflower, peas and nut roast. Yummy. 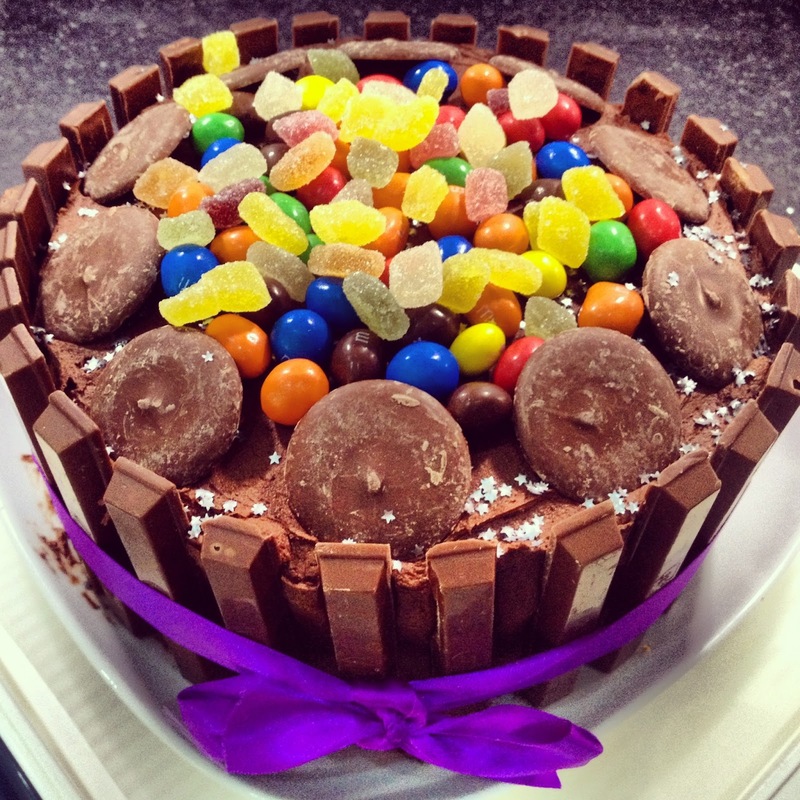 This cake has done the rounds on an internet forum I am a member of, and I book marked it as one to make to welcome Lex home after he’d spent the summer with his dad this year. It looks impressive but is actually a doddle to make and decorate, and any kid (or adult for that matter!!) that sees it can’t resist breaking out into a huge grin. You can put whatever you want round the sides and on the top. I was under strict orders from the boy with what I included but let your imagination run wild! Begin by making the cake batters. In separate bowls cream together the vitalite and sugar, beating for 10 mins until light and fluffy. Add the eggs one at a time, alternating with the flour or flour and cocoa mixture. Finally add the zest and juice and thoroughly incorporate. 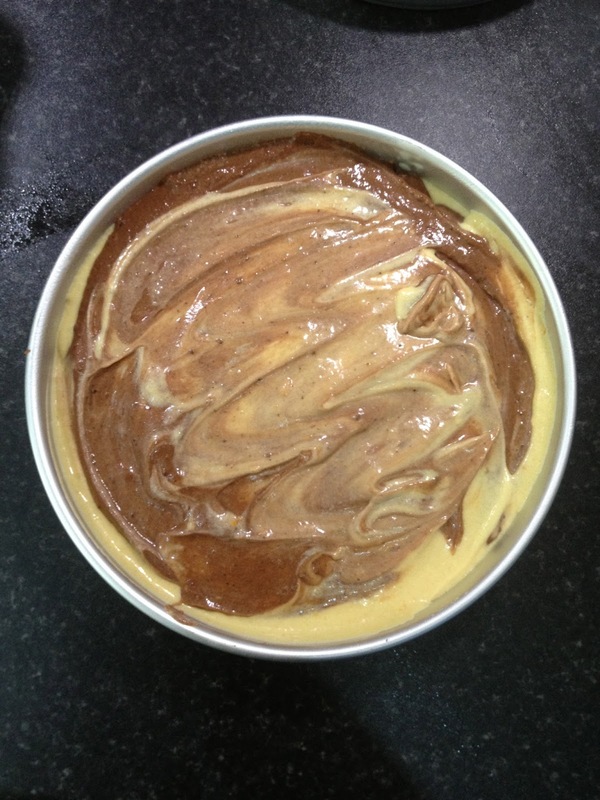 Dollop spoonfuls of each mixture across both tins, and once all the batter is in, swirl to mix lightly for the marbled effect. Bake at 170 degrees for about 25-30 mins until the cakes are well risen, starting to shrink away from the sides of the tin and fully cooked. Leave to cool in the tin for a few minutes before turning out onto a cake rack to finish cooling completely. Beat the icing ingredients together for 10 mins until light and fluffy. Use to sandwich the cakes together and then cover the outside of both cakes with a good layer of icing. 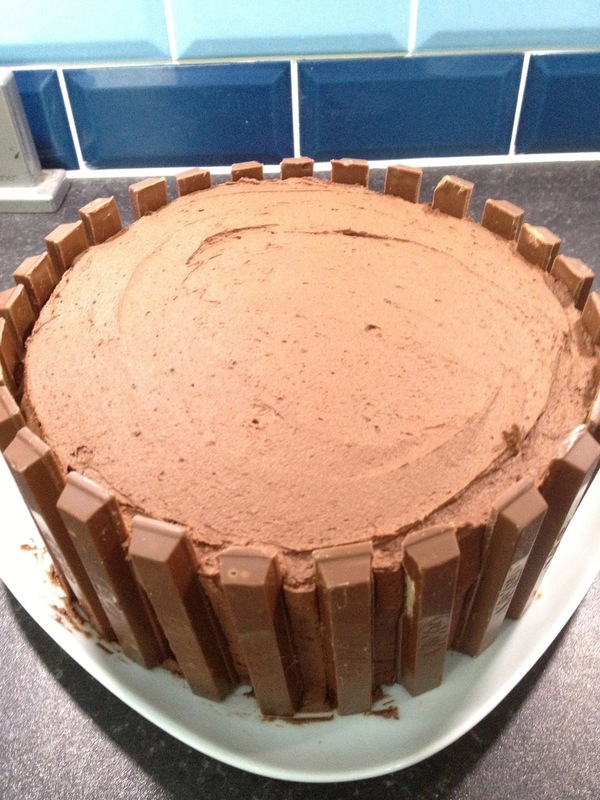 Once you have done this, start to stick your kitkats (or chocolate finger biscuits or whatever else you have chosen!) to the outside. Then add your decoration of choice. 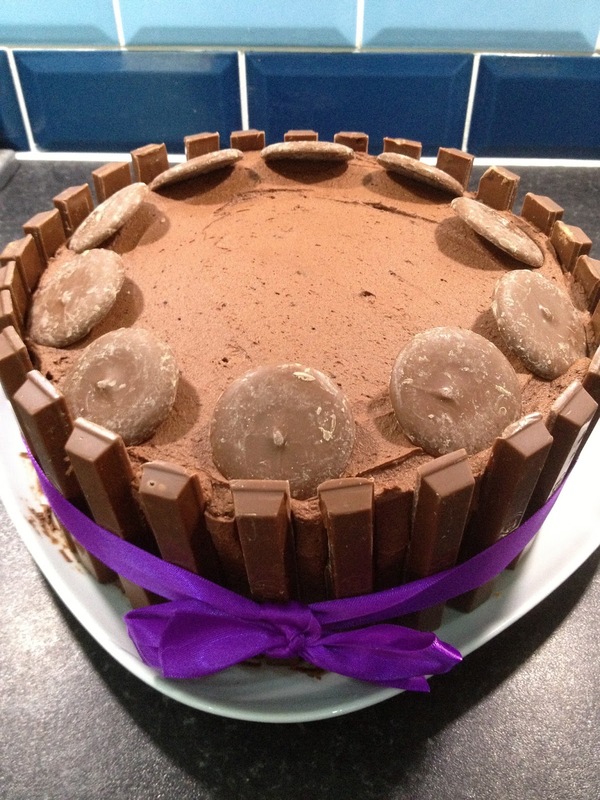 Some people like to just cover with maltesers or other sweets, but my cakes were very deep, and there wasn’t a lot of overspill room above the kitkats so I used giant chocolate buttons and then filled the inside with other sweets. Finally, tie the ribbon around the outside of the cake (this helps to ensure the kitkats don’t fall off as well as giving an extra wow factor ;-)) and scoff. I recommend palming the children off on to grandparents once the sugar rush hits mwahahahaha! 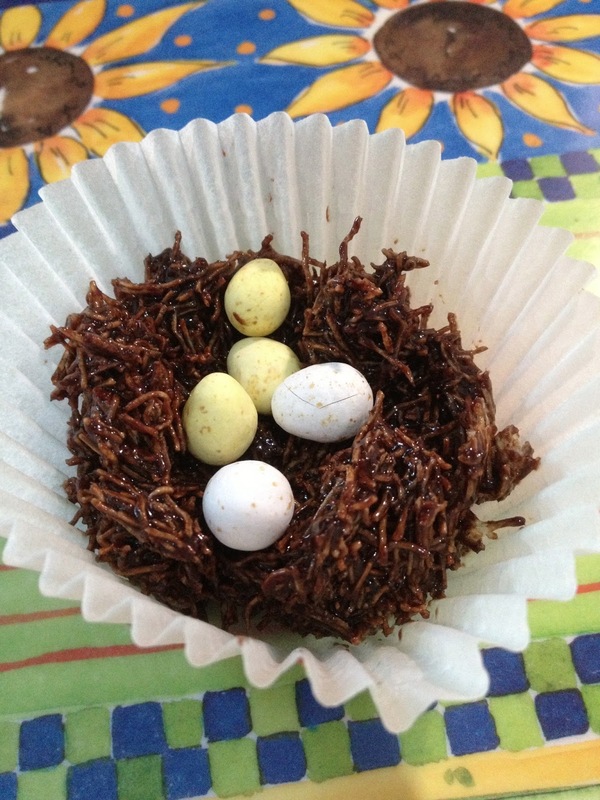 Easter isn’t Ishtar without these nests. I prefer to use a base of butter, golden syrup and drinking chocolate/cocoa for the chocolate rather than melting chocolate as they remain softer and nicer to eat that way. This is a great recipe to get the kids to do, or to make to bring back memories of the last day of school! Melt the butter, golden syrup and drinking chocolate in a pan gently. Mix into the crushed shredded wheat and then spoon into cases. Leave an indentation in the middle for the eggs to nestle in to. Top with eggs and leave for an hour or so to set. Yummy! 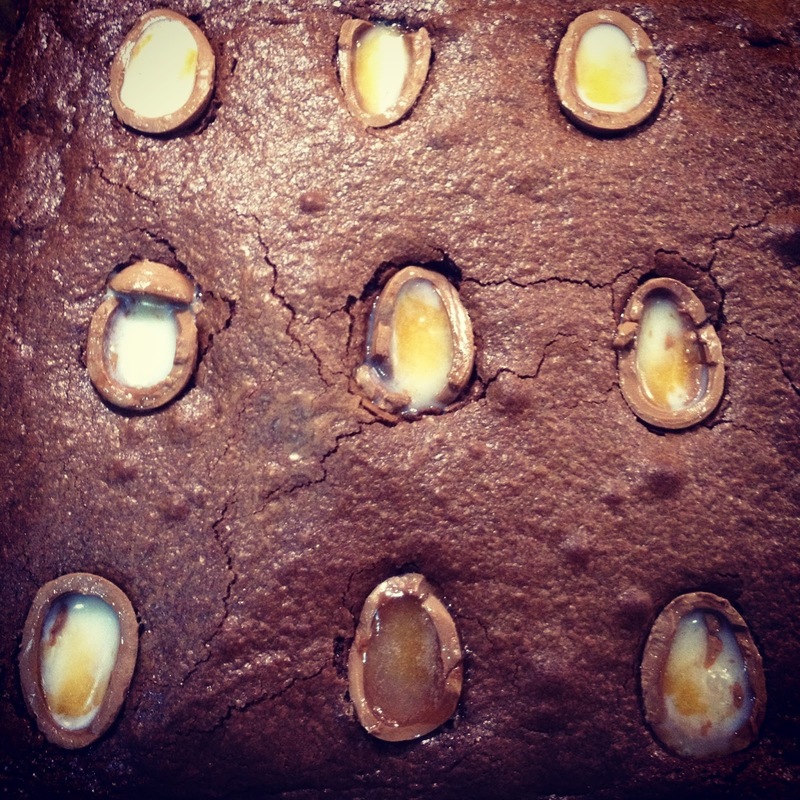 A brownie adorned with a cadbury’s creme egg showed up in my newsfeed on Facebook earlier in the week, so I decided to treat us to some for Easter. 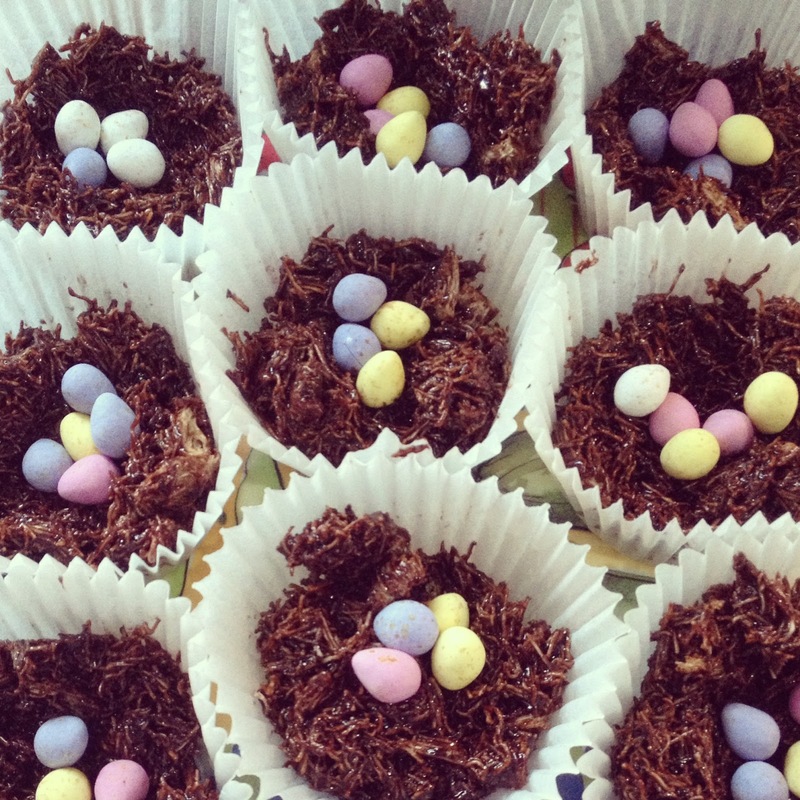 I’ve used mini creme eggs as the large ones would have made them too sickly (imho!). The brownie recipe I have used is my tried and tested adaptation of the Hummingbird Bakery’s plain chocolate brownie which is chewy and moist and delicious. Enjoy! Melt the chocolate and butter. Once melted and cooled slightly, mix in the other ingredients. 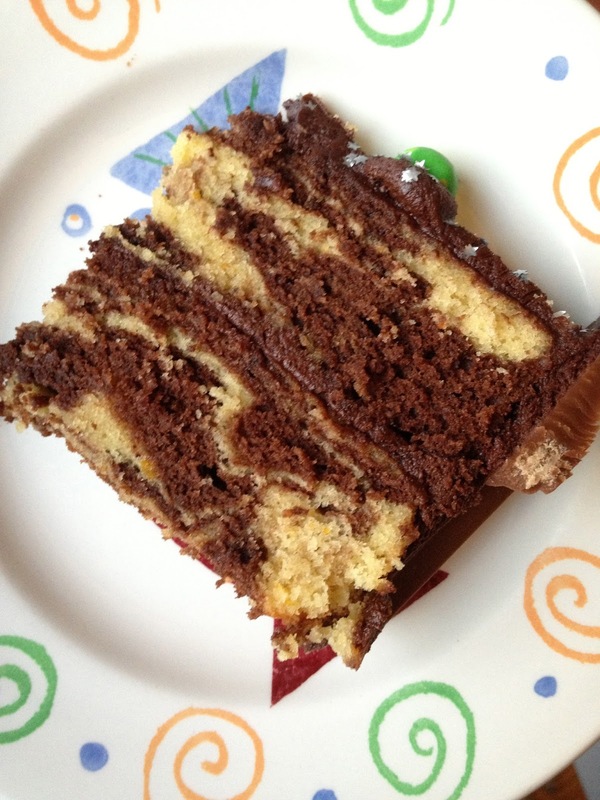 Pour the batter into a lined swiss roll tin and bake at 160 degrees for about 15 mins. Carefully cut the eggs in half, but don’t worry too much if they break a bit. 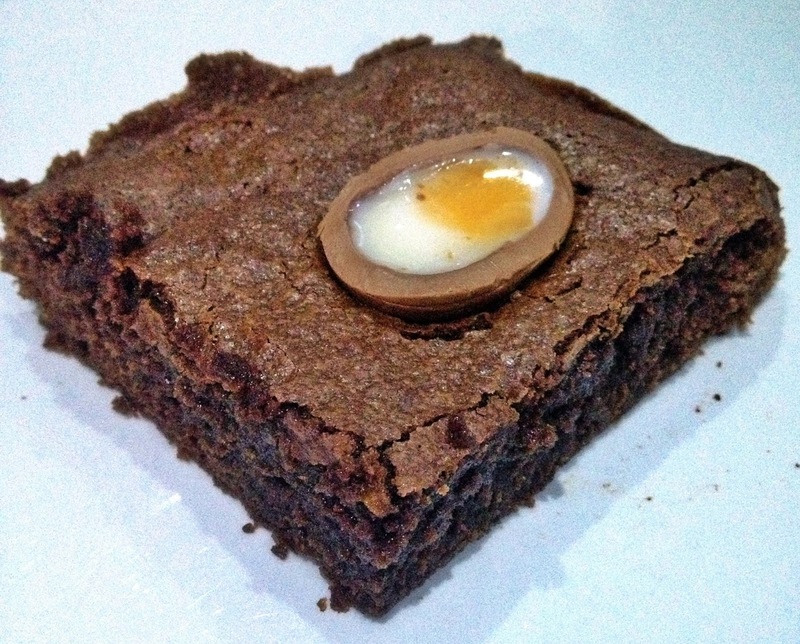 After 15 mins, take the brownies out of the oven and push the halves of eggs into the semi cooked batter. Place them back in the oven for a further 15 mins to finish cooking. 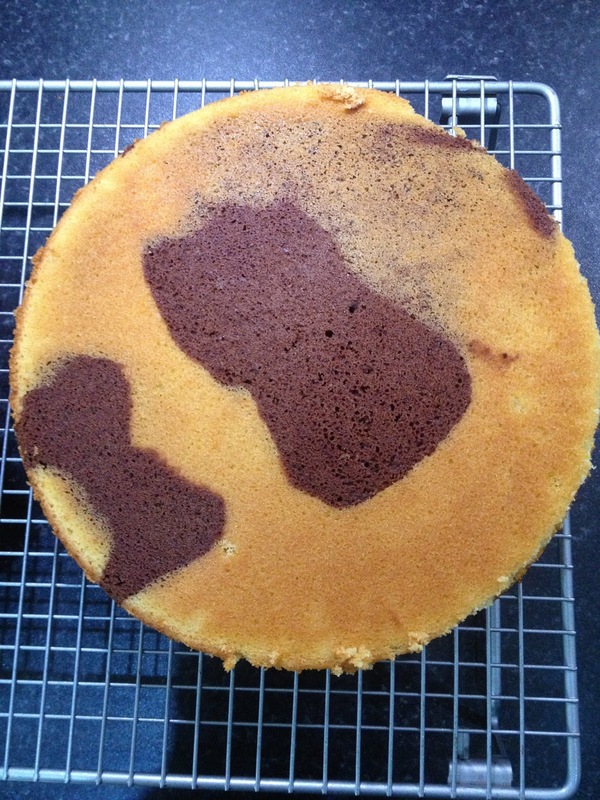 Leave to cool for 10 min before removing from the baking tin and slicing into generous squares. Happy Ishtar!